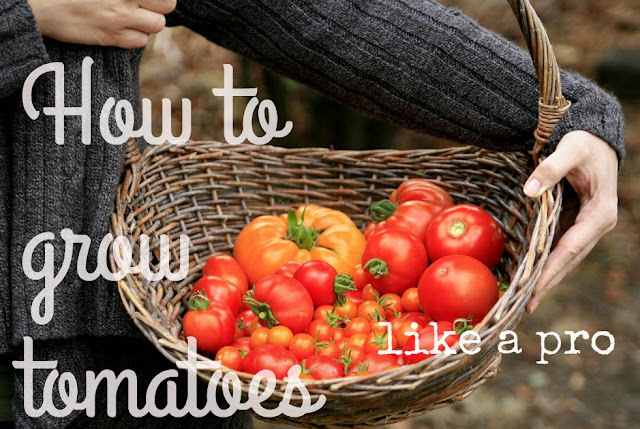 A tomato is a tender fruit that is easy to grow but there are some tips and tricks that help them grow more successfully - and I am going to share mine with you! 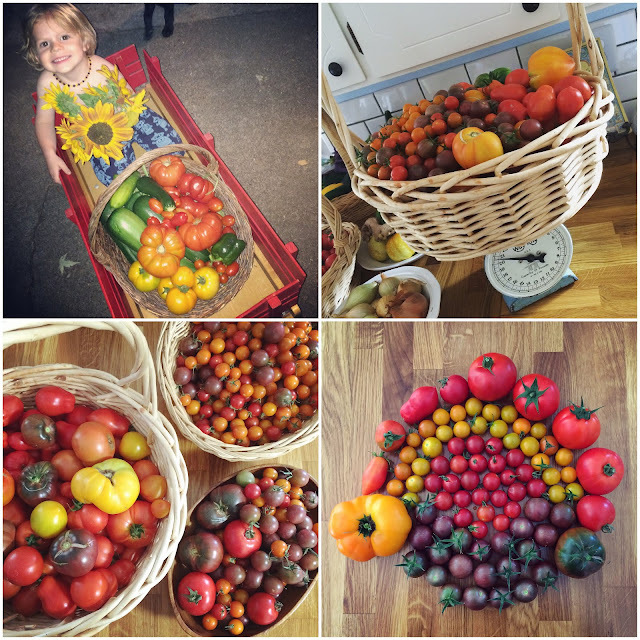 Last year I got just shy of 200 lbs of tomatoes out of my garden. 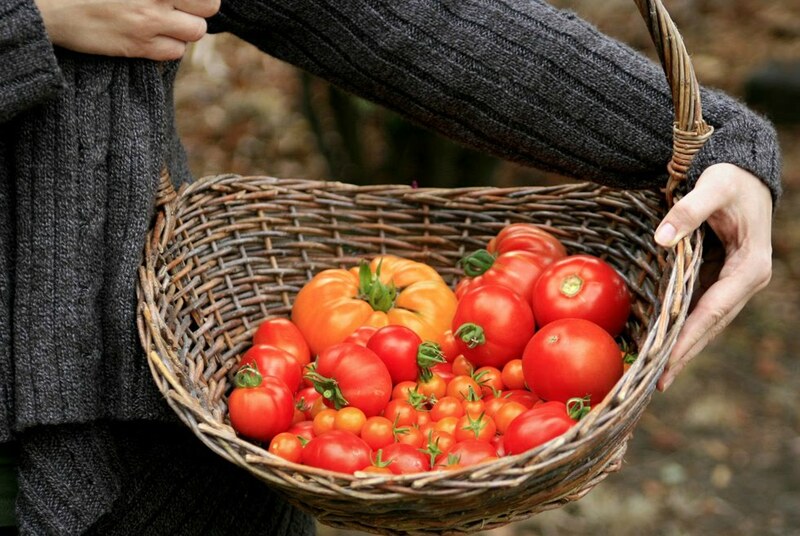 My tomato plants were almost 10 feet tall and they produced until the first frost when I gathered all the stragglers and put them on my windowsill to ripen. For a while I was buried in tomatoes. This is the third year I have used this method and I have had SO much success that I want to share how it works. So first, gather your materials. You want long, tall stalks. 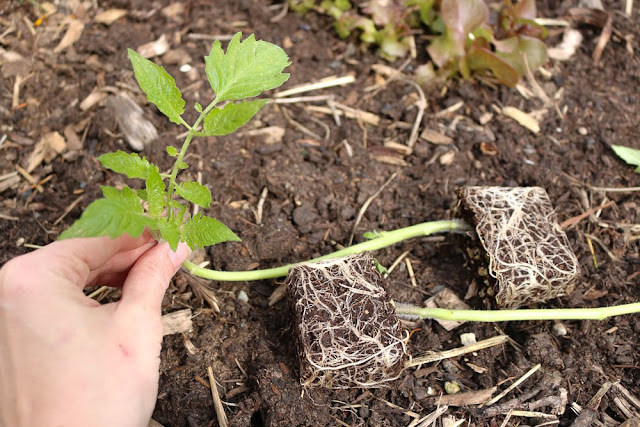 If they are in bigger pots that is fine, but root structure doesn't matter as much as stalk length. 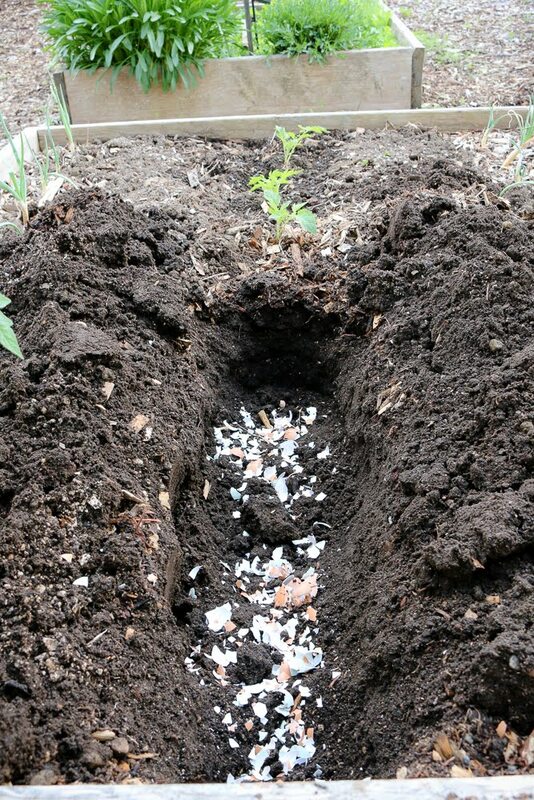 Step 2: Dig a trench. The trench should be 9-12 inches deep and 12 inches wide. My beds are 6 ft so that makes my trench in these example pictures 6'x12"x12". Step 3: Amend your soil. For each 6'x12"x12" trench I add 1 cup blood meal, 1 cup bone meal, a dozen or so egg shells and 2 aspirin (eggshells and aspirin are crushed up in the food processor). 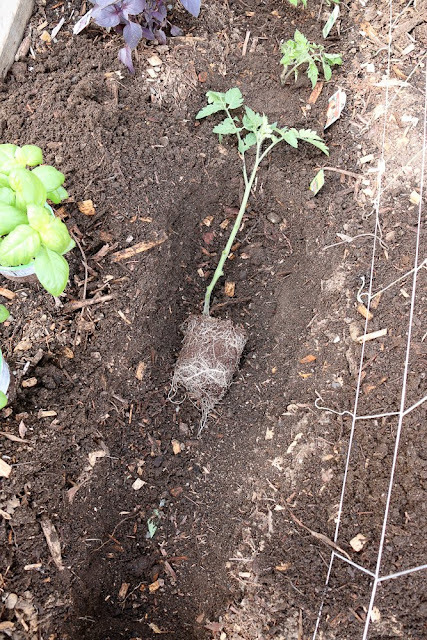 I put all of this in the bottom of the trench and I mix it in with soil really well. Don't worry if you can't see it when you are done. The plants will find what they need. Step 4: Gently remove all the leaves below the first branch. What you want is a long stalk with no leaves except the top 2 or 3. This stalk is 14 inches tall and I cut all of the branches and leaves off but the top two branch sections. Do you see how fuzzy the stalk is? 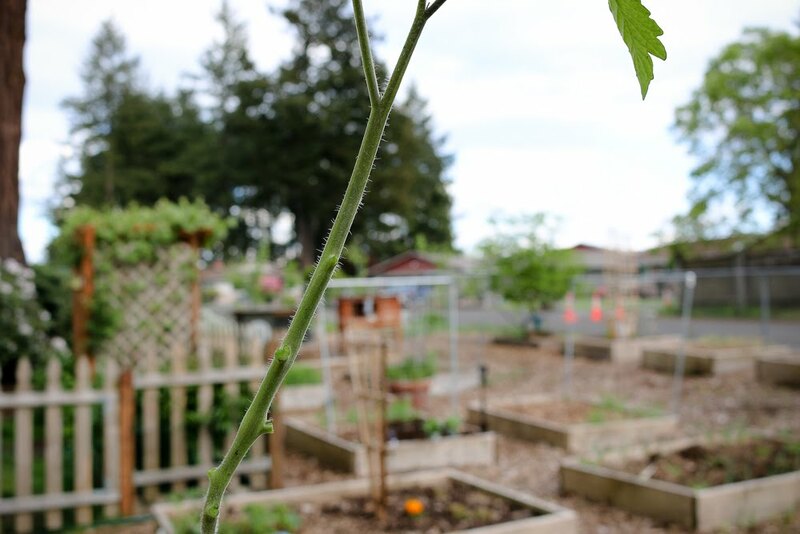 Every hair on the stalk will turn into a root if you bury it in the dirt. Which in the end, gives you an incredibly strong root structure for your plant! 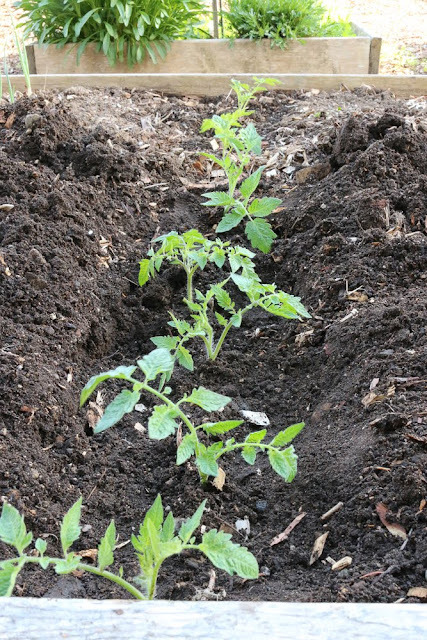 Step 6: Fill the trench with soil until it reaches it resembles tiny tomato plants, all in a row. The amendments in this trench will feed the plants and boost the green production before they are ready to flower... speaking of flowers! 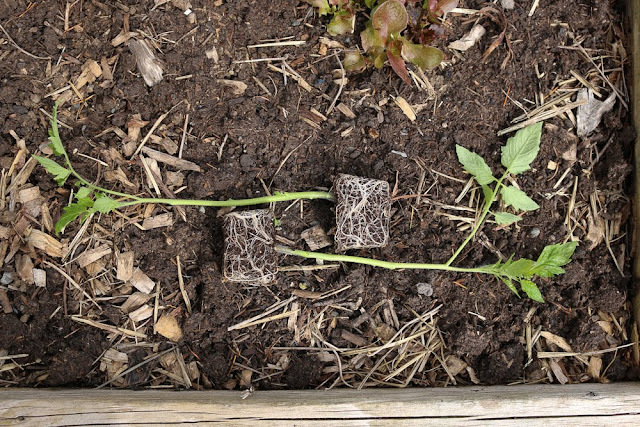 NOTE: If your plant has a flower before you put it in the ground, remove it! The early fruit is not worth the drain on the plant while it is trying to grow all it's leaves back. Step 7: WATER DEEPLY. You just shocked the pants off this plant. It needs time and water to recoup from the trama. However, you will quickly see the plants turn even more green and start to put on new leaves. With in weeks, they will have caught up and grown past all their counterparts. 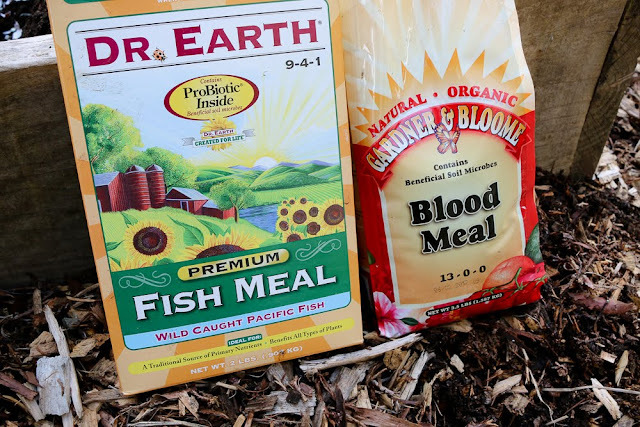 One more NOTE: Dogs love bloodmeal and fish meal. If you must, put cages around your tomatoes to keep your fury friends out! That's all folks! Happy Gardening! 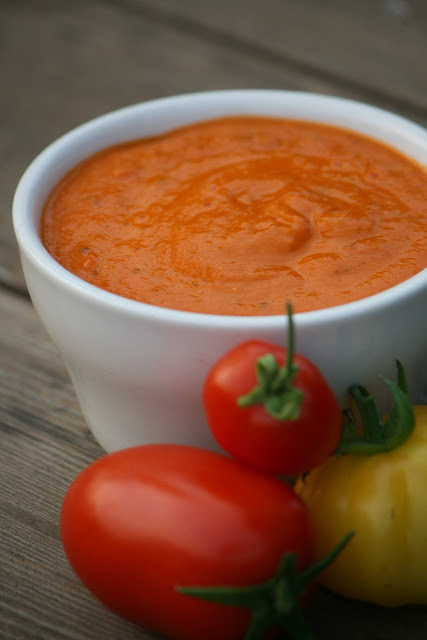 Want the best recipes for your incredible harvest of tomatoes you're about to have? Thank you so much for sharing your secret formula on how to have abundance of tomatoes! I am visual learner so the pictures and all the details were really helpful! 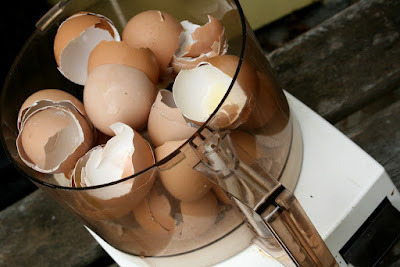 I am really excited this year to try this new method. I hope it works as well as it does for you. I passed this on so 2 others I know are also trying it. I will have to let you know what all of our results are. I was wondering if you could tell me how much should I water?? 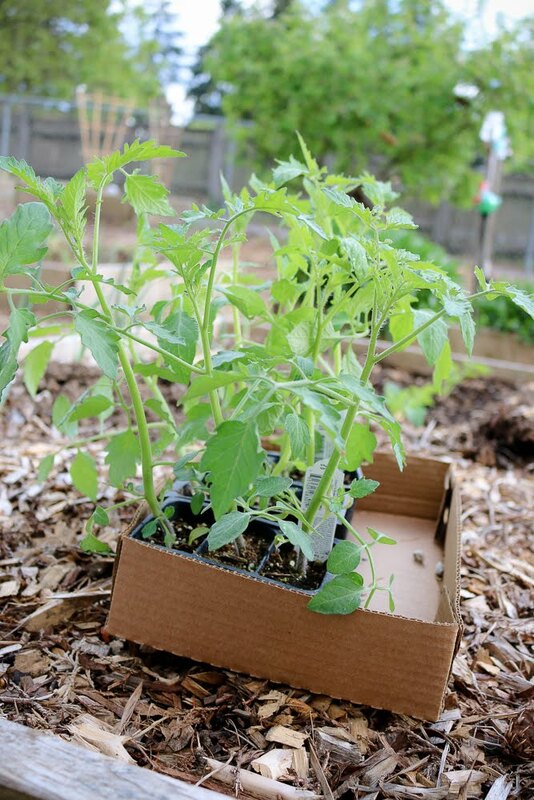 Also what is a good ground cover for tomatoes? Hey Rachel! Ground cover.... I generally just allow them to be on their own in the row. I do plant basil and onions in the same bed with them, but nothing close enough to be a ground cover. I also water with a sprinkler. Not the most efficient method, but definitely the cheapest. ;) I water very deeply the first week or so, and then about twice a week for 20 minutes or less. Tomatoes are heat lovers, so they don't mind as long as their roots dont get dry. 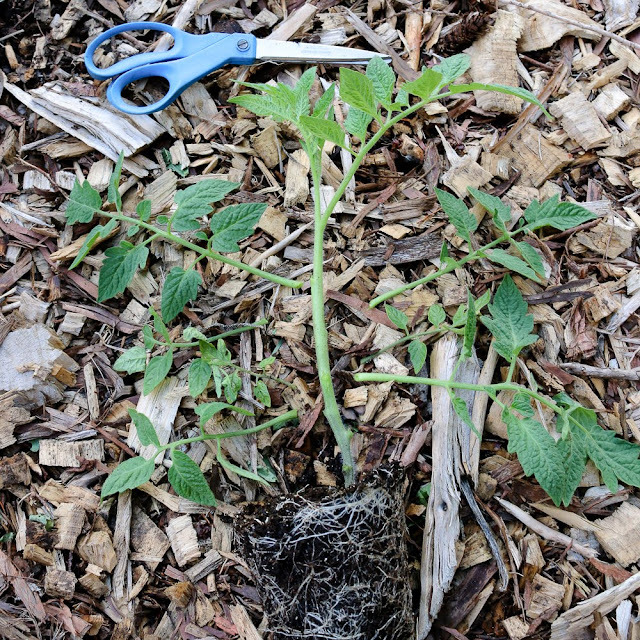 Later on I will share how I prune them (it's not hard, just hard to describe) and that gives a little bit of sunlight into the inside of the plant, helping everything ripen faster without straining the plant too much.